We thought it was just another spring storm. They're frequent in Oklahoma. After awhile the wind was howling. I looked out the front door glass and saw the garage disintegrate. Mother decided that we should go to the storm cellar. She tried, but the pressure would not let the door open. She took us children into a center room then where we huddled in the corner. Mother prayed, "God save us," and He did. The tall Victorian-style house swayed on its foundation. SCARY. When the storm passed, my father entered the same door that wouldn't open earlier. He exclaimed, "I thought you'd go to the cellar!!" He had been milking when the storm struck and the barn blew away, leaving him and the cow untouched. He had made his way to the house by holding onto the fence and crawling. Four farm buildings were destroyed. That was the second close call for me. 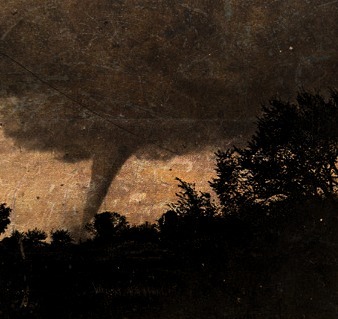 A tornado struck eight years earlier. I was an infant lying in the center of the bed. When the storm struck, mother rushed to pick me up just before a rafter from the barn came through the wall and landed where I had been sleeping. I have memories of seeing hailstones the size of tennis balls, blinding sandstorms, and the aurora borealis, but those memories do not compare to those of the tornado.